Are Doorway Gates A Good Investment? Doorway gates are scissor like barriers that enlarge to restrict traffic to areas like warehouse dock doors, entranceways, receiving doors, lift-up doors, hallways or storage areas Doorway gates offer safety and security while allowing air to circulate freely through the area. Restricting particular areas from unauthorized personnel has always had its related challenges. The main test has been to allow light and air to circulate through door openings. Solid barriers disallow air flow to the inside. This can pose problems for the storage of certain chemicals that need cooler temperatures to remain non-volatile. Solid barriers are weighty, expensive and take longer to setup and remove. Well-built vertical gate rails mount and pivot gate entirely out of opening. 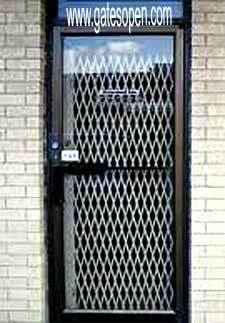 All Doorway folding gates larger then 6′ are fitted with self-securing center drop pin. All collapsible scissor gates come with brackets, bearing washers and casters. Screws and locks not included. Gates have universal mounting on face or in casing. 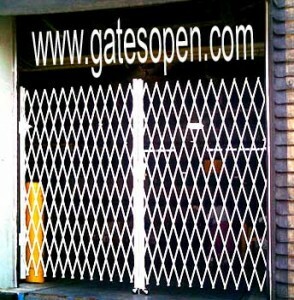 We offer custom installation on any of or steel folding doorway gates! Just tell us what you need, and we’ll find a solution. Call us for a FREE Quote.